WebDAV stands for Web-based Distributed Authoring and Versioning. It is an extension to the HTTP protocol, that allows numerous users to access and manage remote documents simultaneously. 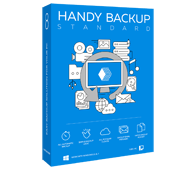 Handy Backup software allows working with WebDAV folders as effectively as with common folders of a local hard disk. You can use WebDAV data as a source of data, or as a destination for your backups. There has always existed a problem of editing the same file by more than one person. The WebDAV protocol puts an end to this routine. Any file being edited is locked until the changes are applied, so the next user will apply changes to the modified file only. As WebDAV uses XML, it is possible to store a list of authors on Web resources. They can be retrieved, modified or deleted using the DAV protocol. DASL, DAV searching and Locating protocol, allows searching for the resources, basing on property values. As resources need to be copied or moved, WebDAV supports copy and move operation. This way, collections similar to file directories can be created and listed. To use the WebDAV plug-in, you need the Home Standard edition of our software. Download it and start your 30-days trial period now! Advanced Collections. This feature includes support for ordered collections, where the server keeps a single order of URLs in a collection. It also includes support for referential resources, which allows a user to remotely created references to another resource. Versioning and Configuration Management. Support for file versioning will allow checking-in, checking-out and retrieving the history list. The ability to retrieve a previous version, through links to the previous versions, will also be supported. On top of versioning is configuration management. It allows managing versioned resources and their collections. Access Control. This feature is the ability to set and clear access control list. This function is crucial for allowing numerous developers to work in collaboration on a resources and add or remote other developers. In its most general sense, this is the ability to control access not just for DAV, but for the Web. The glossary contains 178 terms. The current section Network contains 5 terms.